MISSION, Texas -- Heavy machinery has started to roll in near the National Butterfly Center, which straddles the Mexican border. Customs and Border Protection has positioned vehicles here. And construction workers and architects have started plotting out their work for the next few months, and possibly years. As the nation's capital grapples over how to fund the controversial border wall, construction of a new one in the Rio Grande Valley is set to begin in the next few days. 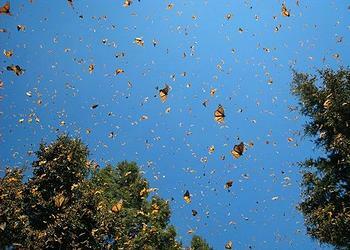 Let's see ... the sovereignty of our country and protecting our citizens v. some butterflies, wildlife and trees. Indeed. No contest. I'd take the sovereignty and safety of our country over some butterflies and trees any day. Enjoy your imprisonment if you get it. I hear what you're saying and believe me I've thought about that scenario and I've also thought about the possibility of a North American Union. There are no guarantees. I am confident though that this country cannot continue its very lenient immigration policies and continue to disregard the sovereignty of this country and the safety of its citizens; we will wind up being another Europe. 33 miles of fence like the one dozens of people in your photo are sitting upon is imprisoning you? If you say so, drama queen. OK...as long as I'm royalty. A border wall isn't going to hurt the butterflies all that much. Just something to perch on. ...hmmm.... you would think that most conservatives would think that this was great news! Meanwhile ... the butterflies will still be free to fly. Page created in 0.61 seconds with 22 queries.